Eamon and Seamus share a century behind the bar! Eamon Molloy and Seamus McCaffrey in the famous McConvilles bar which is an A-listed building. With a combined 100-years-plus of experience in the licensed trade under their belts, there isn’t much that Eamon Molloy and Seamus McCaffrey don’t know about dispensing all manner of elixirs – from whiskey to wine, Guinness to beer. But despite all that experience, they would never purport to be connoisseurs of ‘The Drink’ they have served over the various counters and over the decades. Like the true professionals they are, they have always determined to keep a clear head to deal with the occasional obstreperous client they have encountered along the way. Seamus is a Pioneer and doesn’t imbibe, while Eamon has indulged “only very occasionally”. With their eagle eyes and gentle psychology, they developed a sixth sense at spotting a prospective inebriated trouble-maker long before the situation rolled out of control. And – often before the client even realised it – he/she was gently escorted through the exit door and on the way home to sleep it off! Eamon will always be synonymous with the famous McConville’s on the corner of West Street and Mandeville Street, where he spent his entire working life. He is still welcome and respected when he calls with Robinson’s, the new owners, who have preserved the best of the wonderful, old listed premises and added their own modern touches. He speaks affectionately and expertly of the days when they bottled their own Guinness (150 ‘dozen’ a week) and a wide range of wines, and when Daly’s and Power’s whiskeys were king. “It was all so different in those days,” said Eamon, whose forte in the trade was expertly preparing draught Guinness – he never really approved of the bottled genre. Meanwhile, Seamus was mainly connected with Maguire’s premises in Thomas Street. He served his time and worked a large chunk of his career there – from the days it was Crummie’s. Sadly, it’s now derelict, like other sections of Thomas Street – although Portadown 2000 in William Street has ambitious plans to expand back to the old Thornton’s Wholesale Site, next door to the pub premises as part of a major refurbishment of the area. His party trick was whizzing ‘a bottle of Guinness’ along the bar which – to the amazement of new clients - hit the wall and bounced. It was made of rubber! Seamus’s career was more eclectic than that of his old friend Eamon. He has pulled pints and served various elixirs in establishments like Felix McKeever’s. The Crown, Parkside, The Queen’s, Hagan’s, all anxious to have a man with his acumen and presence. He spent an enjoyable nine months in Omagh, but Portadown was always where his heart lay. The hotel trade, expansion of the club scene and the selling of all sorts of drink in supermarkets, have cut into the traditional pub trade – and, of course, most of those which survived, have to provide musical entertainment to keep the drink flowing. Not to mention the ‘pub meal’ scene which is so much part of the scenario these days. The two barmen can rattle off just about every pub that existed in Portadown over their five decades – some are still in their families, others have changed hands and many have called ‘Time’ and retired. They reckon that Portadown houses about half the numbers of the 1960s when they both started their careers. Past and present establishments include – Pentland’s in Edenderry, now Gary’s, The Classic also renamed, The Imperial Hotel, long since demolished, McCabe’s in High Street, Kelly’s, Brankin’s (The Tunnel), Prunty’s, Bennett’s, Meehan’s, McKeever’s, Gordon’s, Ma Berry’s, Johnston’s (Davy Stewart), Parkside, Shamrock Chalet, Bowles… The list goes on and on. “You could write a book about them,” both men agreed. They have rich tales to tell. Eamon’s favourite is about a client who called (during the Troubles) to quench his thirst after he’d been to the gym, and inadvertently left his bag containing his gear on the doorstep of the pub, as he left. 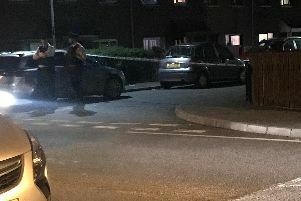 Soon, the bomb squad was on the scene, the area was cleared of people and a controlled explosion dealt with the “suspicious object” which consisted of trainers, gym equipment, a wet towel and all the rest! Seamus tells a more affable tale. It was the night of a midweek football match between Portadown and Linfield at Shamrock Park, and a Blues supporters’ bus was spotted in Thomas Street, headed for Maguire’s.